Veda Krishnamurthy is an Indian professional cricketer born on 16 October 1992 in Kadur, Chikkamagaluru District, Karnataka. She is a right-handed batswoman and bowls right-arm leg break. Her father moved from a small town in Karnataka’s Chikkamagaluru to Bengaluru to help realise his daughter’s dream of playing for the country one day. She started her formal cricket training in the Karnataka Institute of Cricket in 2005 when she was 13. Later, she went on to play in the same team as her Idol, Mithali Raj, in both domestic and National Team. At 18, Veda scored a half century on India debut in Derby and, admittedly, got complacent. Three years out of action and a job with Indian Railways far away from home, in Delhi, threw her out of her comfort zones and gave her the chance to introspect and improvise. Since the comeback, Veda has grabbed every opportunity to become an indispensable part of India's limited-overs side. She made her debut in T20 International Cricket in an Australia Vs. India tiff at Billericay on 23 June, 2011. The same year, she made her first appearance in a One Day International against England Women at Derby on 30 June. 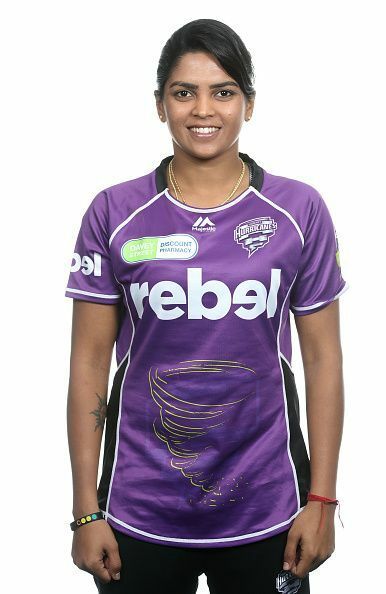 Veda came to light in October 2017 when she secured a deal with the Hobart Hurricanes for the third season of the Women's Big Bash League season. She is the third cricketer from India to play in the Big Bash and will be joining the duo of Hayley Matthews and Lauren Winfield. Krishnamurthy was also a part of the Indian team to reach the final of the 2017 Women's Cricket World Cup where the team lost to England by nine runs. A terrific fielder still, aggression is in Veda's genes. She'd often been criticised for throwing her starts away in one-day cricket but her all or nothing approach has done India more profit than harm. In February 2018, she became the youngest player for India Women to score 1,000 runs in WODIs, during the third WODI against South Africa. In October 2018, she was named in India's squad for the 2018 ICC Women's World Twenty20 tournament in the West Indies. At her belligerent best, Veda can be a threat to the best of the bowling attacks, and is widely deemed to finish amongst the best finishers India ever produced.